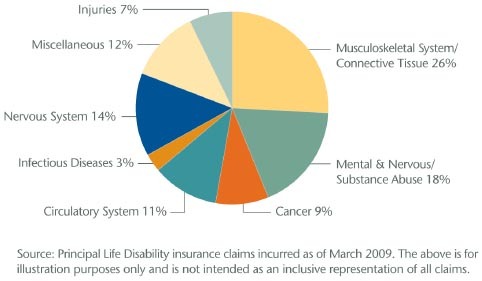 DI Statistics - Personal Disability Insurance | Source Brokerage, Inc.
View the “true” facts about income-interrupting disabilities. Emotional impact versus insurance protection for various events. A disability can happen to anyone…at any time. In the last 10 minutes, 490 Americans became disabled. In 2008, there were 2.1 million disabling injuries caused by a motor vehicle accident; there were 39,000 fatal motor vehicle accidents. In the home a fatal injury occurs every 12 minutes and a disabling injury every 3 seconds. At age 40, the average worker faces only a 14 percent chance of dying before age 65 but a 21 percent chance of being disabled for 90 days or more. The probability of a white-collar worker becoming disabled for 90 days or longer between the ages of 35 and 65 is 27% for men and 31% for women. A new Harvard University report reveals that 62 percent of all personal bankruptcies filed in the U.S. in 2007 were due to an inability to pay for medical expenses. 90 percent underestimate their own chances of becoming disabled. 85 percent express little or no concern that they might suffer a disability lasting three months or longer. 56 percent do not realize that the chances of becoming disabled have risen over the past five years. Most Americans can’t afford to become disabled. Indirect and direct costs of a disability take financial tolls on everyone. Nearly three-fourths of disabling injuries in 2008 are not work related, and therefore not covered by workers’ compensation. 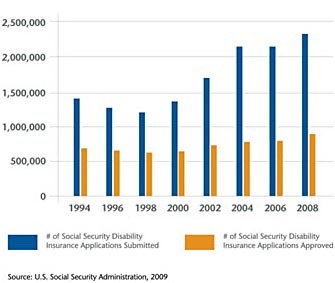 Less than half – 35% – of the 2.8 million workers who applied for Social Security Disability Insurance (SSDI) benefits in 2009 were approved. The average monthly SSDI benefit is $1,064. There is a need for disability insurance. 43% of employees indicated protecting financial assets due to an unexpected event as a main concern. 61% of employees surveyed said good employee benefits encourage them to work harder and perform better; 61% said good benefits keep them working for their current employer. Fewer than one in three (29%) U.S. workers have private long-term disability coverage. Only 30% of American workers in private industry currently have access to employer-sponsored long-term disability insurance coverage. – National Compensation Survey: Employee Benefits in Private Industry in the United States, U.S. Department of Labor, Bureau of Labor Statistics, March 2006. The odds of selling a product to a new customer are 15 percent, while the odds of selling to an existing customer are 50 percent. The top reason producers are not selling IDI is because their clients do not ask about the product. Despite the fact that more than 70% of American households rely on two incomes to make ends meet, only 26% of Americans have any type of disability insurance. – Facts from LIMRA May 2010 Multimedia Fact Sheet, based on findings from LIMRA’s life insurance consumer studies. Only 18% of consumers recall being approached about buying disability insurance – less than half as many as those being approached for life insurance. Only 13% of small business owners have disability income insurance. Who buys disability insurance? While men represent the majority of new sales, sales to females grew at a slightly faster rate than sales to males in 2008. Older age groups bought more policies in 2008, with an increase in both the 50-59 and 60+ age groups. There is a clear need for more information and education about solutions that are available to help during a disability. Only one in three workers surveyed associate financial planning with protecting assets and income (38%), tax planning (33%), or saving for a home purchase (32%). Nearly nine in ten workers surveyed believe that people should plan in their 20s or 30s in case an income limiting disability should occur (86%). Only half of all workers have actually planned for this possibility (50%), and only half have even discussed disability planning (46%). 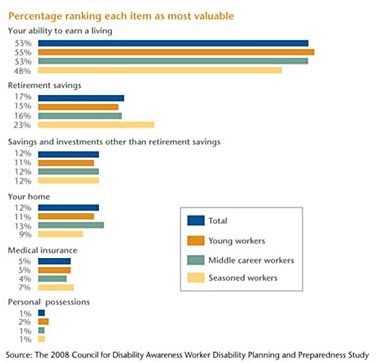 When surveyed what is most valuable in helping them achieve long-term financial security, far more workers rank their ability to earn a living as number one (53%) than assets such as retirement savings (17%), other savings and investments (12%), their home (12%), medical insurance (5%), or personal possessions (1%). The large majority of workers are concerned about how they would pay their living expenses if they were disabled (82%), yet most are not prepared if such a disability were to extend for any significant length of time. Seven in ten could cover their expenses for six months or less. 66% of executives surveyed believe that providing financial advice at the workplace is more important than it was a year ago. 76% of employed baby boomers and 68% of employed Generation Y workers say that the employer is among the most reliable sources of information about benefits. Only 5% of baby boomers realize they have a 34% chance of becoming disabled during their working years. 45% of employees feel not at all knowledgeable about individually owned disability insurance. 14% of employees personally own a disability income insurance policy on themselves, a significant decrease from 1st quarter 2008 when 18% reported owning such a policy. Only 7% of employees’ spouses own a disability income insurance policy. There is a need for disability insurance solutions for businesses.